The Gulf Intracoastal Waterway (GICW/GIWW) provides the mariner with an almost continuous, and protected passage just inside the Gulf of Mexico Coastline. Beginning at Mile Marker (MM "0.0") in San Carlos Bay near Punta Rassa, FL at 26°30.6’ N / 82°01.1’ W, and extending to Brownsville, TX (MM "681.5 WHL") at 25°57.0’ N / 97°24.1’ W.
From its starting point, the GICW runs in a general northerly direction for 150 miles to 28°10.4’ N / 82°49.5’ W; (MM "150.0") located in the vicinity of Anclote Key and the entrance to the Anclote River near Tarpon Springs, FL. After leaving Anclote Key, it is a 140 NM open water passage to the vicinity of Carrabelle, FL where you can again rejoin the Gulf Intracoastal Waterway at (MM "376.0 EHL"). From this point your course will carry you generally west to the Sabine Pass, TX area where your course will then take a gradual turn to the south ending at the Port of Brownsville, TX, (MM "681.5 WHL") very near the U.S. / Mexican Border. The total distance is 1,368.6 statute miles which includes the 140 NM open water passage between Anclote Key and Carrabelle, FL. Like the AICW, the GICW/GIWW, is made up of both natural and man-made canals, rivers, dredged channels, bays, and sounds. It is used by both commercial and pleasure craft with many light-draft vessels as well as tugs and tows making use of the Gulf Intracoastal Waterway in an effort to avoid long open water passages in the Gulf of Mexico. The GICW/GIWW is marked much the same as the AICW, with Aids to Navigation displaying yellow triangles or yellow squares to indicate the waterway. While typically yellow triangles will be found on red markers and yellow squares found on green markers, caution should be exercised and the rule below observed; especially where the Gulf Intracoastal Waterway may intersect or merge with another channel marked by the Lateral Buoyage System. Lights and daybeacons should not be passed close aboard because those marking dredged channels are usually placed back from the edge of the channel and others may have riprap mounds around them to protect the structures. All distances along the Gulf Intracoastal Waterway are given in statute miles unless otherwise noted. Statute miles are used in order to conform to the distances shown on the small craft charts typically used along this route. Like the AICW, the portion of the GICW between Punta Rassa, FL and Anclote Key, FL is measured based on increasing mileage from MM "0.0." Unlike the AICW, mileage on the remainder of the GICW is measured east (EHL) or west (WHL) of Harvey Lock (MM "0.0") which is located very near New Orleans, LA. The Federal Project Depth for the GICW between MM "0.0" and MM "150.0" is 9 feet. The remainder of the GICW provides for a least depth of 12 feet. DO NOT confuse "Project Depth" with "Controlling Depth" or for that matter with the actual depth of the water that is available at the time of your transit. Controlling depths and Project Depths are printed on most charts where an improved channel is shown. They are also published periodically in the Local Notice to Mariners. While every effort is made to maintain the project depth, the actual controlling depths in the channels may vary due to shoaling reducing the available water depth until maintenance dredging can be accomplished. All operating bridges along the Gulf Intracoastal Waterway guard either VHF Channel 09 or 13. All locks on the GIWW guard either VHF Channel 13 or 14. The U.S. Coast Guard advises all vessels to exercise caution in any area where the GICW intersects major shipping channels. A "Security Call" on VHF channel 13 is requested prior to crossing any shipping channels, especially during periods of restricted visibility. At last count (01/01/2019), a total of 80 bridges cross the Gulf Intracoastal Waterway between Punta Rassa, FL and Brownsville, TX. While the fixed bridges generally provide vertical clearances of 65’ or greater, some exceptions do exist. The minimum overhead clearance of fixed bridges over the GICW is 48’ at the Highway 361 Bridge (MM "533.1 WHL") at Aransas Pass, TX. An alternate channel is available to bypass this bridge. In the Florida section, (3) fixed bridges with clearances of 50’ are found; the Dupont Bridge near Panama City, FL (MM "295.4 EHL"), the Brooks Bridge near Ft. Walton Beach, FL (MM "223.0 EHL"), and the Navarre Causeway Bridge near Navarre, FL (MM "206.7 EHL"). No alternate routes exist for these bridges. Vessels requiring more than 50’ vertical clearance must leave the Gulf Intracoastal Waterway at St. Joseph Bay via the Gulf County Canal (MM "327.0 EHL") and sailing coastwise, re-enter at the west end of Santa Rosa Island near Pensacola, FL (MM "180.0 EHL"). There are (7) locks along the GICW with (5) being located in Louisiana and (2) in Texas. Caution - Many of the overhead cables over the waterway carry high voltage, and an extra margin of safety should be allowed when the weather is threatening. Tidal ranges are fairly small along the Gulf of Mexico coast. Under normal conditions the mean range of tide varies from 1’ to 3’ between Ft Myers, FL and St George Sound, FL; decreasing to less than 1’ through Alabama and Mississippi. The tidal range then begins increasing slowly through Louisiana and Texas peaking at around 1.5’ at Port Isabel. Even with these small tidal ranges, the tides are often a major headache for many mariners transiting the Gulf Intracoastal Waterway. Some areas of the GICW have diurnal tides with only (1) high and (1) low each day. Some have semidiurnal tides with (2) highs and (2) lows each day, while other areas have mixed tides exhibiting (2) unequal high tides and (2) unequal low tides each day. 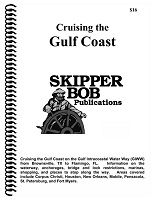 Cruising the Gulf Coast of the United States - Best anchorages, bridge and lock restrictions, free docks, marinas, shopping and places to stop from Flamingo, FL to Brownsville, TX along the Gulf Coast Intracoastal Waterway (GIWW). Mile by mile highlights of the waterway including caution notes and lowest marina and fuel prices. Areas covered include Corpus Christi, Houston, New Orleans, Mobile, Pensacola, St. Petersburg and Fort Myers.